OXUS Group brings together the knowledge and experience required to meet our client’s needs. This enables our clients to succeed in government-funded contracts or private sector projects in Afghanistan and other markets in the region. Our team has a deep-rooted understanding of the political, legal, economic, cultural, and social challenges of the countries in which we operate. 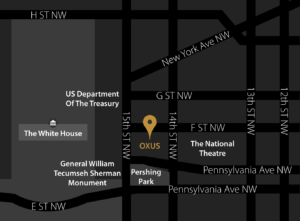 OXUS Group’s team members spread across the United States, Japan, Afghanistan, UAE and Italy. Our team is comprised of former senior government officials, retired military and police generals, former cabinet ministers, governors and parliamentarians, a former attorney general, a former senior commercial officer as well as a broad range of the private sector elite professionals from the region. Moreover, we have staff that speak not only fluent English, but also the language of their local region. This allows us to facilitate our clients’ needs with a better understanding of the issues that are important to them. Our experts can assist our prestigious clients with their needs in the countries in which we offer services. With hands-on management and supervision, we safeguard the interests of our clients. OXUS’ presence in Italy provides clients an important gateway into the European Union with its vast and growing array of business capacity and opportunities. This location allows OXUS to leverage European corporate relationships for our clients and their teaming partners to access export markets or sources for critical products, services and technologies. Over the last 20 years, Dubai has established itself as the business, logistics and financial hub for the region. OXUS’ presence in Dubai leverages local corporate relationships to provide customers with access to essential technical capacity, products and services.